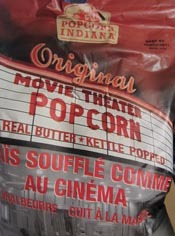 Testing it out: Popcorn Indiana Movie Theater Popcorn – could it be?? You mention movie theater popcorn and anyone who’s been to a theater can instantly recall the smell and taste of it. Gosh, it’s an addictive and intoxicating smell and even as I’m typing this, I can smell the signature movie theater popcorn scent in the air. Sure, it’s a little salty and all, but you have to admit, it has a memorable smell, taste, and texture. So, you can imagine my skepticism when I saw Popcorn Indiana had come out with a Movie Theater Popcorn. Really? I read the ingredient list of the Popcorn Indiana Movie Theater Popcorn: popcorn, canola oil, clarified butter (milk), salt and decided it was natural enough to try. Is it possible to have the same movie theater popcorn experience in a bag from a grocery store? I open the bag of Popcorn Indiana Movie Theater Popcorn and instantly come to a conclusion: it’s not movie theater popcorn – the smell isn’t the same. I then go to try the Popcorn Indiana Movie Theater Popcorn and also come to the realization that the crunch is different too. Now, you’re going to think I’m being picky but anyone who’s eaten movie theater popcorn knows there’s a signature crunch (unless you end up with a foul bag that’s too old but that’s a different story). My recommendation to Popcorn Indiana: I would have believed you if you had said ‘yummy buttery popcorn, naturally delicious’ but in my humble eyes, you fail to meet the movie theater popcorn expectations. It’s not that the popcorn isn’t yummy, it is. In fact, the Popcorn Indiana Movie Theater Popcorn is probably a gazillion times healthier than the actual movie theater popcorn. The Popcorn Indiana Movie Theater Popcorn just isn’t movie theater popcorn, that’s all. So, if you make the ‘movie theater popcorn’ claim, it is highly likely that you won’t be able to meet people’s expectations. For one thing, movie theater popcorn is usually warm and toasty (at least, it is if you get it fresh) and it’s pulsating with that movie theater popcorn smell made all the more prominent since the popcorn makers in the theaters are going at full steam. One lonely bag of Popcorn Indiana Movie Theater Popcorn just can’t measure up to that level of olfactory stimulation. And, you already know what I think about the crunch factor: it’s just, well, different. Would I ever buy the Popcorn Indiana Movie Theater Popcorn again? Probably not, not because it doesn’t taste good. Let me reiterate, the Popcorn Indiana Movie Theater Popcorn is tasty and it’s probably healthier for you than the stuff you get at the theaters. Where I have the issue is with Popcorn Indiana marketing it as ‘movie theater popcorn’ because it isn’t. To me, that’s like setting up the lowly consumer (ie. me) for disappointment because there’s no way anyone can live up to that expectation. Another reason why I won’t be buying this Popcorn Indiana Movie Theater Popcorn again: I’ve made my own popcorn at home before (just plain old kernels with a bit of oil and salt) and it tasted just as good. So, if I can’t get the movie theater popcorn experience in a bag, then I might as well save myself some money and make my own popcorn which tastes just as good. Enough said. If I say anymore, I’m going to have to find myself a late night movie to go to so I can grab myself a fresh box of popcorn! Like this blog review? Let others know: Tweet it!